Armored Sight Flow Indicators are used to observe the flow of liquids in a piping system. A rigid steel housing surrounds the sight tube and provides additional strength and protection from mechanical impact. 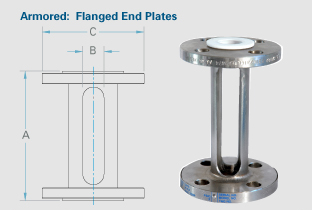 Threaded and flanged connections are available in a variety of sizes to match the diameter of the pipe being used. A wide range of housing materials are available. Units can be made with any overall length if additional visibility is required. Wetted materials consist of glass and the connection end plates. 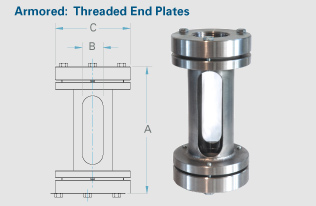 Recommended for low pressure vertical or horizontal applications. Maximum pressure allowable will vary with temperature and size.